Up there on the purple moor, anyone might lose their moral compass. Once, Phil and his sister and I and a three year old Maddie went walking on Bodmin Moor. And the other adults were so engrossed in conversation that they did not notice Maddie had asked to stop to look at a stone, and they strode ahead and soon Maddie and I were alone on the Moor. And I found myself suddenly, unaccountably unnerved. A moor is a singular space, where heathy eternity mixes with great crags of stone which stand jagged on the sullen mountain-hills they call tors. We stood next to these natural stone monoliths, which are nothing to do with humanity but more with the universal being of things. Up there is plentiful evidence that man has been worshipping the elements for three tbousand years. Up there, there is no good or bad: only the will to survive. Just an instant before now, in stone time, they built Jamaica Inn. In 1750, it was constructed crouching on an apex of major road running down through Cornwall , now the A30. It was intended as a Coaching Inn – or was it? Did the Smugglers have their eyes on it as a base, even before the first stone of that grey granite-and-slate place was laid? There were, local lore declares, not your average smuggler. The Smugglers of Cornwall were often of a darker type: the wrecker, which lured ships with lights onto lethal rocks, drowning the passengers and crew, and making off with the contents. Some time in 1930, the author Daphne Du Maurier took her horse out riding on Bodmin Moor. And -terrifying development – the mist came down. You lose all sense of direction in those things, and could wander in circles until you perished, or died of exposure; or plunged off a ledge to certain death. 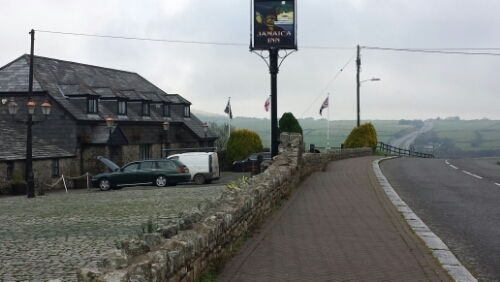 It was the lights of Jamaica Inn which drew her to safety. And I have not yet found the part of her writings which chronicles her receptionif there is one. But the place affected her so profoundly that the low, utilitarian building became the centre of one of her most famous and well loved novels. Jamaica Inn knows its worth today. The grade II listed building remains a hstelty, though tourists’ cars have long since replaced horse-drawn carriages. The building is covered in signage declaring the presence of gift shop and museums, and a modest coach park has been laid out alongside. The great gravel forecourt, redolent of so much raw drama, is cobbled now, and visitors are invited to try the stocks-fabricated for the purpose- and take a photograph. But it’s all a Pygmalion exercise, like trying to gentrify a wild-eyed beggar. The long low house sits on the road to Truro, untamed and hooded, keeping its secrets deep within its walls. You can’t change it, or its moor, and undulating unpredictable, beautiful place: despite the dual carriageway which carves a route nearby. You can’t change a Smuggler’s Rest. Posted in Literary lives, Places to visitTagged Cornwall, Daphne Du Maurier, Jamaica InnBookmark the permalink. Hi Cindy….it’s such a wild part of the world, even now. And grey as slate. Enjoy your reading! Lovely, informative and entertaining post, Kate, as always. Love the pics and I expected to see the Hound of the Baskervilles jump right out of the post. I must post some more on FB, Lou. The mist gives the Cornish land something very special. Kate, I’ve been following your blog for years now, and I’m enamored of all things British. I watched “Doc Martin” on hulu.com countless times, start to finish, and you and Doc Martin convinced me that I want to live in Cornwall. The sea! The air! The views! Enchanting, you all are. Ruth, what a fantastic comment, thank you so much! Port Isaac was my village for a while, and it is, as you say, absolutely enchanting. 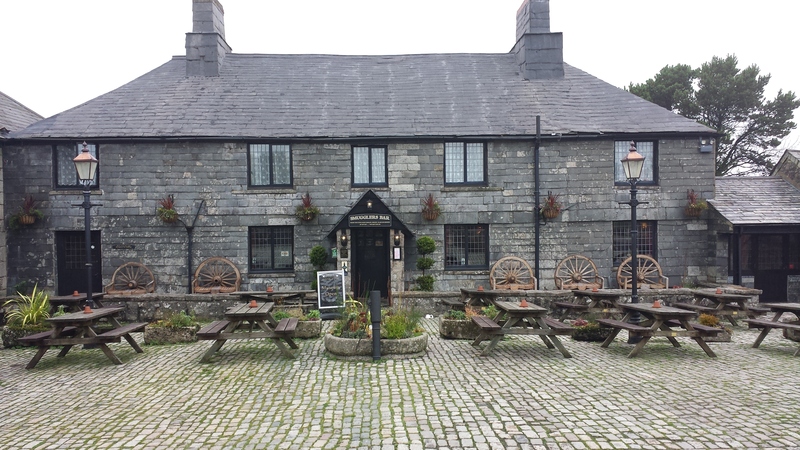 Watch the episode of “Doc Martin” about “going Bodmin”. They are daunting but they call like sirens, Celi! I shall be revisiting soon to look at iron age ossuaries which, though long since raided, are still out there on the moor. It is a magical place. Haunting post, Kate! What a perfect backdrop for Hallow E’en! So, I sit here wondering why I have never read Jamaica Inn. I must remedy that soon – as well as visit the moors. A wonderful post, Kate. Enjoy your Halloween. Penny, you would love it, and all Daphne’s books. They are sophisticated, and clever, and dark, and English. And most unexpected! I lover her novels. Thanks for the wonderful pictures and the background info! My pleasure, Mouse: I was staying in North Hill, where Mary runs to get the Magistrate. Daphne used to ride through in her horse. Impressive solid architecture that’s standing the test of time. Any idea why it’s called Jamaica Inn, Kate? I know that Jamaica is a Commonwealth of the UK, but has that anything to do with the origin on this inn’s name in 1750? hi Virginia: it does not, as so many say, come from the Jamaican rum which was smuggled through. Rather, it is thought to trace back to a local family of landowners in nearby Trelwany who were governors of Jamaica in the 1700s. I really loved that book. It made me fall in love with the idea of the moors, which I’ve still never visited. Except here. I have loads more pictures of those moors and the villages around, Andra….I’ll pop some up on Facebook/Google Plus. It is an entrancing place. Oh I do love seeing Jamaica Inn, Kate. I loved that book, and in fact, this past weekend decided I had to purge my library shelves and at least “thin the herd.” I came to my row of Daphne Du Maurier and just couldn’t do it. When I was a teen I requested my family to change my name to Rachel after reading My Cousin Rachel. I would absolutely love to walk the moors…I think Heathcliff and Catherine, of course! Maybe some day! Wonderful post! A list: Five things on the bedside table.